Yesterday afternoon my husband and I enjoyed a Spirulina Passion smoothie after our walk. We discovered Spirulina a couple years and have done our best to keep it in our home ever since. Spirulina is a must-have in my opinion! Spirulina is a blue green algae which is often distributed dry and provided in forms of powders or capsules. Spirulina contains 60-63% vegetable PROTEIN which is 3 to 4 times HIGHER than BEEF and FISH. What? That's right! It is also like drinking a multi-vitamin! Spirulina is incredibly high in B-12 more than 3-4 times higher than that found in liver. High volumes of gamma-linolein acid which can prevent heart disease and reduce cholesterol. AND it has Phycocyanin which is ONLY found in Spirulina and has been referred to as the WONDER Molecule! Helping to detox our bodies from toxins and metals, strengthen our immune system and act as an anti-inflammatory and more. It is stated consumption of Spirulina leads to optimal health and in a current environment full of pollution and toxins, Spirulina is more than recommended some state it is required! There are many ways to consume Spirulina, my favorite is by adding some powder to my smoothie. Yesterday I was having an "everything but the kitchen sink" moment and kept adding ingredients to the smoothie so while this recipe has a variety, you can add spirulina to virtually any smoothie or take it in a capsule instead! 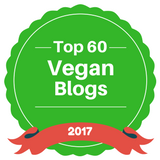 I have you to thank for the discovery of Spirulina as I found it through this blog. Blogging has led to the discovery of so many healthy new vegetables, fruits, herbs, tinctures, elixirs, supplements and more! I love learning more and am thrilled to share what I learn with you! It's hard to believe it's been over 2 years since I started blogging and over 1 year since I released my first cookbook! I'm currently working on a brand new cookbook with BRIGHT vibrant plant based recipes that I can't wait to release to you! Okay lets get down to business and make a HEALTHY smoothie! 2. Blend on Smoothie setting or high speed until a smooth consistency. 3. Pour and serve cold! I hope you enjoy the many benefits of spirulina and this smoothie!